Sorry for not posting yesterday, but the website has been a major success and I was busier than I expected! Using a variation of the changing hydrangea, I came up with a wine inspired wedding. In saying that I don't mean that it needs to take place in Napa, only that it needs to capture the deep colors and richness of a good glass of red wine. I envision this wedding having a ceremony at dusk, followed by a relaxed family style celebration. 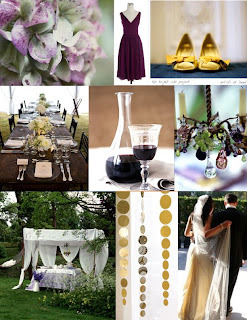 The colors would compliment the colors of the woods- deep eggplant/merlot and cream, with pops of yellow. The rest of the decor would stay earthy- using lush greens, wrought iron, and weathered wood. This board in particular makes me want to throw a relaxed backyard dinner party.